She looks like a bitten, bruised and battle-scarred tigress. Her triumphs dismal, her defeats momentous. Theresa May goes down in British history as the prime minister who suffered the worst parliamentary defeat, till date. She held snap elections to increase her majority, only to lose it. She made the worst party conference speech in history. She has been unable to deliver the only thing she is in office to do–midwife Britain’s exit from the European Union. Now, parliament threatens to wrest the Brexit process from her control. Like the phone, May is shockproof. Brexit is Britain’s tryst with destiny. It could be a tryst with “disaster”, fears Business Minister Greg Clark. Following the 2016 referendum in which Britain voted to leave the EU, the nation has slid into chaos, pathos and uncertainty. “We are moving dangerously close to a chaotic Brexit,” says Dieter Kempf, president of the Federation of German Industries. Most people find the complex details and consequences of leaving the EU incomprehensible. By clearly outlining the new rules and regulations, EU negotiators exposed Brexiters’ "empty and unrealistic promises", says Andreas Utermann, CEO, Allianz Global Investors. Mainly, it is the fear of the unknown. Britain is so poisoned, paralysed and polarised that politicians, parliamentarians, people and political pundits are clueless about what comes next. The nation is split down the middle. There is no consensus on the way forward. French Economy Minister Bruno Le Maire says Britain should say what it wants. But Britain doesn’t know. Ask 10 Britons, and you get a dozen opinions on what Brexit should look like. May’s Brexit deal with the EU is a punctured ball after its massive rejection in parliament. The Plan B she outlined was not much different from the earlier plan. She did not rule out a no-deal Brexit and dismissed the idea of asking the EU for an extension. She also ruled out a second referendum. She, however, agreed to waive the £65 fee for European citizens to remain in the UK following Brexit. She also offered to work with the MPs and the EU on the Irish backstop—a deal to prevent a hard border between Ireland, an EU member, and Britain's Northern Ireland. 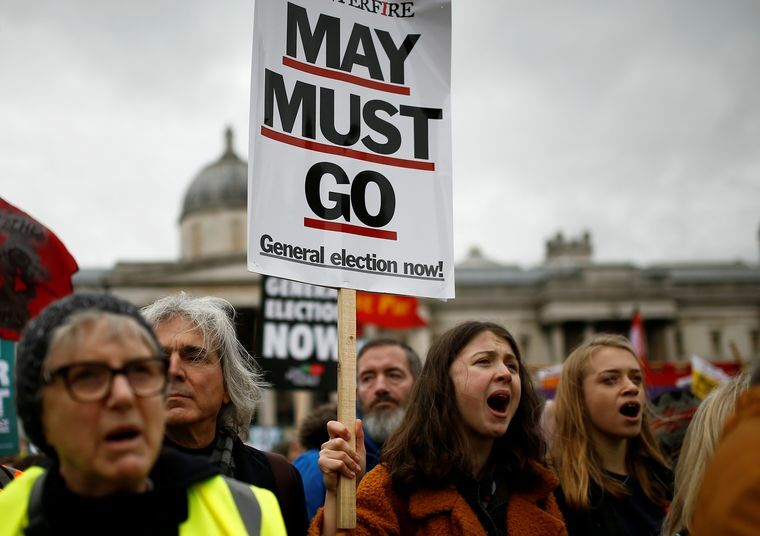 Punters, however, are betting on a second referendum, while astrologers predict May will forge a pact with the devil, but without identifying who the devil is. The options are contentious: if parliament rejects May’s tweaked withdrawal agreement, then Britain crashes out of the EU without a deal, causing bureaucratic logjams, public pain, economic distress and logistics dislocations of nightmarish proportions, including panic buying as supermarkets run out of food, chaos in hospitals as life-saving medicines disappear, long lines of trucks choking ports and people standing in serpentine queues for dwindling supplies. 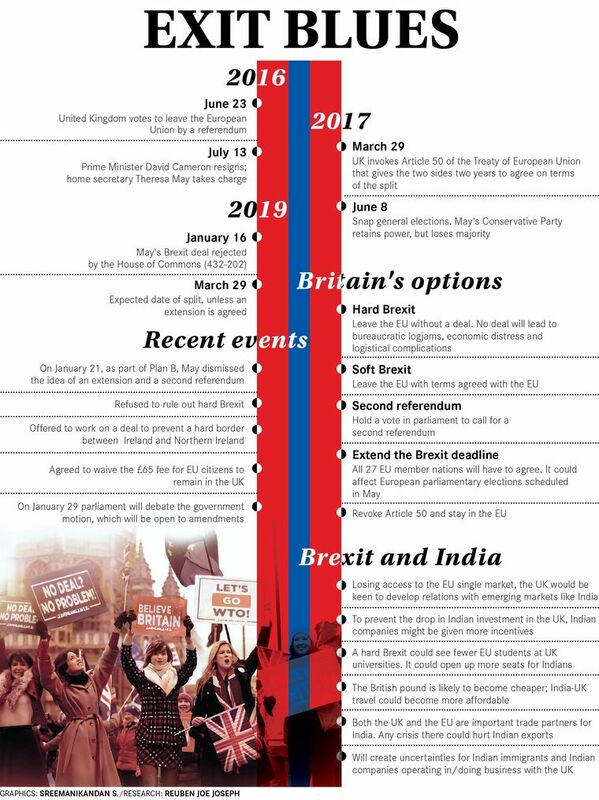 If parliament cannot agree on a deal and the MPs veto a no-deal Brexit, then the alternatives are: to extend Article 50 to delay the March 29 deadline for Brexit, hold fresh elections or a second referendum that reverses the earlier verdict, enabling Britain to remain in the EU. But, if “remain” parliament hijacks the public’s “leave” mandate, it will trigger a “political tsunami”, warns Trade Minister Liam Fox. Referring to the Brexit bedlam and the US shutdown, CNN’s Stephen Collinson notes, “It is hard to believe that two such robust democracies, long seen by the rest of the world as beacons of stability, have dissolved into such bitter civic dysfunction.” The only person who functions with a sense of duty is May. Setbacks for her are not opportunities to correct course. They are occasions to reaffirm her hallowed mandate. May’s upbringing as a vicar’s daughter probably explains her resolve, resilience and missionary zeal for public service. “She embodies values and attitudes which large swathes of the country hold—traditional, socially conservative, provincial, sceptical about EU and immigration,” says Oliver Patel, manager of University College London’s European Institute. May sympathises with the public backlash against the elites. 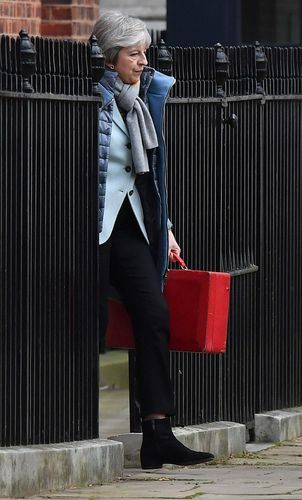 She had her share of them in the Conservative Party, like David Cameron, who recklessly led to the chaos by holding the Brexit referendum, and former chancellor of the exchequer George Osborne—rich, genteel, clean-cut, chummy, entitled, boy-men for whom politics is sport. May is the strict headmistress. "She is held to be possibly humourless, rather severe, perhaps unflinching," says historian Matthew Cole. Some see May’s determination as commitment. Others see it as stubbornness or proof of her self-belief that she is the 'chosen one', a manifestation of vanity like her exotic collection of shoes that she stores in see-through plastic boxes. As chairperson at a Conservative Party meeting in 2002, she did some tough talking on public perception of them as “the nasty party.” But the men’s attention was riveted on her leopard-print kitten heels. History will probably judge May as the prime minister of the Tories rather than the UK. She prioritised avoiding a split within the Tories, instead of reaching out to all parties to strive for a national consensus on Brexit. Inside parliament, the vicar’s daughter spewed insults with a snarl and a curl of her lip at Labour leader Jeremy Corbyn, loathed by all factions in her party. A 'remainer' tasked with delivering Brexit, May was influenced by Conservative Brexiters who imagine an independent Britain reclaiming its former majesty, striking lucrative trade deals with the US, China and India. The public school boys seem out of touch with bleak reality. Donald Trump is a protectionist president. Slowing China is getting increasingly angry with the west. Russia despises Britain. India will extract more visas in return for access to its market. Post-Brexit, Britain will lose the privileges, access and zero-tariffs enjoyed by EU members and join the queue of “third countries” like Turkey, South Korea and Ghana. Remainers say abandoning Brexit is a face-saver. Brexit is also becoming Britain’s tryst with irony. Imperial Britain once had colonies across the globe. Britain, today, behaves like a subjugated nation, wringing its independence and sovereignty from the almighty EU. Fears about the Brexit contagion invading and infecting the EU have largely subsided. While the EU looks united, the 'Disunited Kingdom' faces sectarian violence and breakup due to Brexit-induced dread among the people of Northern Ireland and Scotland.